Must “conservation” and “palm oil” be mutually exclusive? Erik Meijaard from Borneo Futures says no. The oil palm sector is often blamed as one of the biggest threats in tropical conservation. Much of the critique of the sector is justified. Oil palm plantations at industrial and smallholder scale have displaced large areas of tropical forest and their increasingly threatened wildlife. As was shown in a recent study on Borneo, the rate at which this happens is still increasing. So what to do? 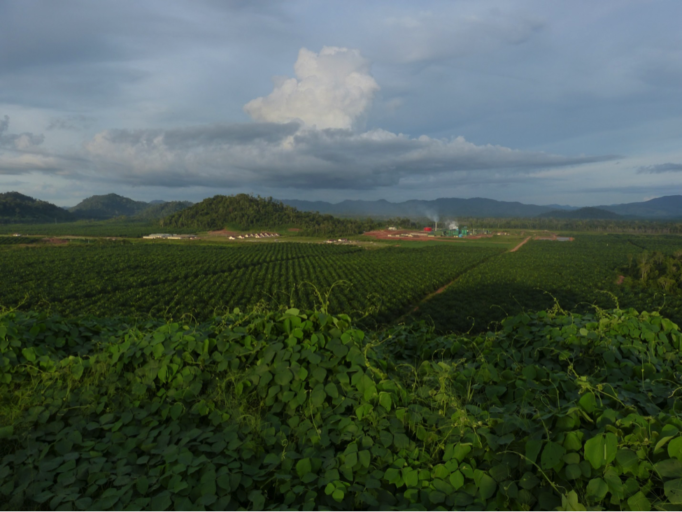 There are several possible strategies for reducing the impact of the oil palm sector on nature. The favoured strategy over the past few decades for many in the environmental sector has been to reject palm oil, with some organisations calling for a total ban on palm oil. Because of the strong public and political support for oil palm development in major producing countries like Indonesia and Malaysia, such bans have remained largely ineffective in slowing the expansion of the industry. Other organisations have called for more sustainable practices in the industry, such as those prescribed through the Roundtable on Sustainable Palm Oil (RSPO). It remains to be seen whether RSPO certification has resulted in much improved environmental and social practices but the fact that NGOs such as the PanEco Foundation are withdrawing support from RSPO is a concern for the sustainability claims of the platform. PT KAL concession in West Kalimantan, showing in green the conservation set asides, and in purple other forest areas in the concession that provide further stepping stones for wildlife moving between protected forests. The large enclaved area in the north is part of the Laman Satong community forest. I honestly don’t think that banning oil palm is going to work. Apart from the obvious ethical and neo-colonial connotations, people selling and buying palm oil simply won’t listen to such bans. It would be a bit like asking Europeans, Chinese and Americans to stop using coal-powered electricity, turn off their home heaters, and stop flying airplanes to reduce climate change – have you done that yet? If the expansion of the palm oil sector is likely to continue, improving practices in the industry is one way forward towards reducing environmental impacts. It is not the only one but it is a very important one. The question is what such improved practices look like, and how we can get companies to implement them. A new publication by UNEP/GRASP titled “Palm Oil Paradox: Sustainable Solutions to Save the Great Apes” discusses what lessons have been learned about improved management practices in Indonesia and Malaysia, and how this informs the development of the palm oil sector in tropical Africa where the industry is also expanding into the ranges of chimpanzees, bonobos and gorillas. Insights were primarily obtained from research in the Kinabatangan area in Sabah, Malaysia, and from a number of concessions in Kalimantan, including the PT KAL concession in Ketapang, West Kalimantan. Not developing oil palm does not mean that the forest will be protected. The PT KAL experience is further highlighted in a recent scientific publication. The company has implemented improved practices with good conservation outcomes, including effectively getting rid of illegal logging and pretty much eliminating fires and snares. To be clear, the development of the plantation has had a negative impact on the local orangutan population. But as the authors stress, it is important to consider what would have happened to these forests if the oil palm company had not been developed. As they point out, the fact that large areas of community forest outside the concession have subsequently been logged, cleared and burnt by the communities, indicates that without management many of these forests would have been doomed. Not developing oil palm does not mean that the forest will be protected. 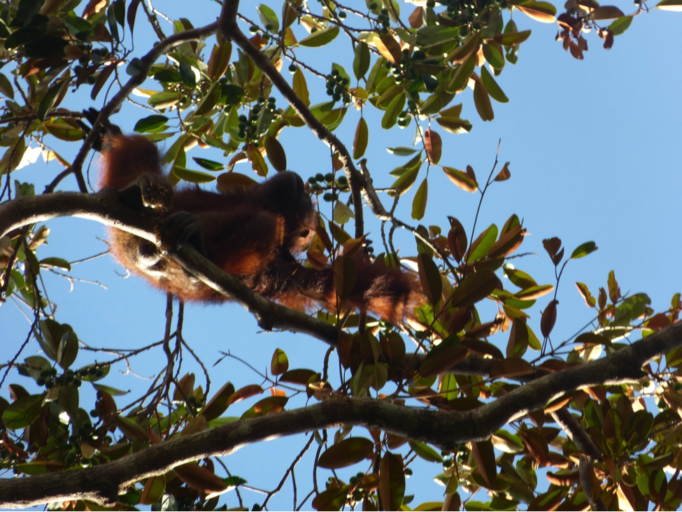 One of the roughly 150 orangutans in PT KAL. PT KAL work with International Animal Rescue on the management of and research on orangutans. Orangutans are followed regularly to understand their movement patterns and nutritional status. Currently an estimated 150 orangutans survive in the plantation. Their densities are unnaturally high though, most likely as a result from forest clearing both inside and outside the concession. 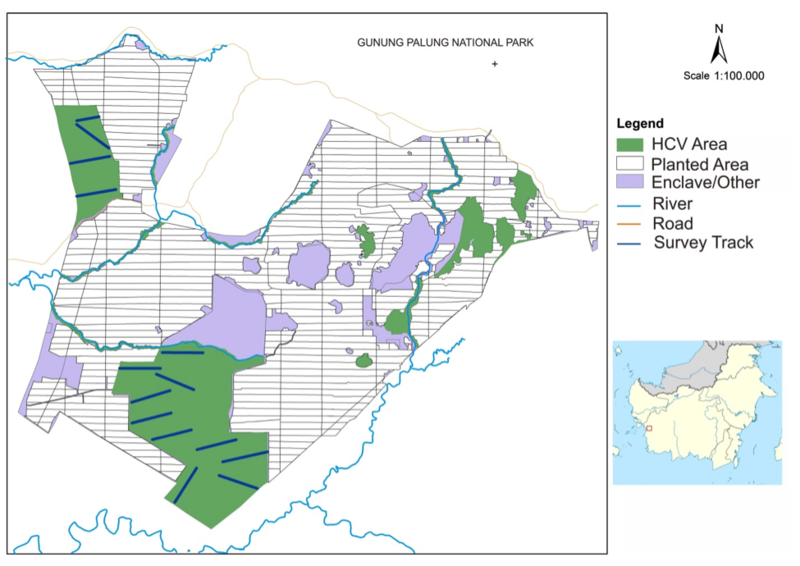 The next management and research phase aims to develop a network of connected forest areas within the concession that are also connected to forest areas outside the boundaries. This makes it important that the management of the larger landscape takes place, involving local government, the various concession holders that operate in the area, communities, and non-governmental groups. This is how that magical concept of “sustainable landscapes” needs to be accomplished – everyone talks about it, but no one knows how such landscapes are actually developed. The sustainable landscape goal is made harder because of the challenges in the Sungai Putri area just south of PT KAL, as reported here. Sungai Putri contains some 1,500 orangutans but is currently slated for conversion to timber and oil palm plantations. If this goes ahead and large areas of deep peat swamp forests are cleared, the orangutans of Sungai Putri will have nowhere else to go than the PT KAL concession and its neighbours. Obviously, the forests in those areas will not be able to cope with the massive increase in orangutan refugees. PT KAL concession showing a newly opened mill and landscape with forested set asides on hills. The future will show what PT KAL’s efforts can contribute to overall orangutan conservation and sustainable development in this area. But the important lesson learnt from this is that oil palm development and conservation can coexist to some extent. The next objective is to show that retaining forests in oil palm concessions actually makes business sense. In places like West Kalimantan, thirsty oil palms are increasingly affected by lack of water, especially during El Niño induced severe droughts. Having access to water stored in forests, and especially in healthy peat swamp forests is a major benefit to the industry. Destroying such forests and their hydrological capacities is ultimately counterproductive and will undermine the development of tropical countries. We are far from turning the destructive oil palm tide. Governments remain very keen on expanding the sector, and the many industry participants push back against legal reforms that require better environmental and social practices. Good examples set by PT KAL and other similar-minded companies show the way forward towards a more sustainable future. Erik Meijaard is a Jakarta-based conservation scientist coordinating the Borneo Futures initiative. This post is republished from Mongabay.